Awards, Memberships & Achievements - The Bussey Law Firm, P.C. Featured in "2019 Top Attorneys in Colorado Springs"
Colorado Springs Style magazine has once again chosen Timothy R. Bussey as one of its Top Attorneys in the county. These lawyers are the best of the best, chosen by their peers. Approximately 900 licensed lawyers in El Paso County voted on the nominations, and three "top attorneys" were ultimately named per practice area. Mr. Bussey was selected for four different categories: Class Action Law, Criminal Law, Criminal Traffic Law, and DUI Law. Featured in "2018 Top Attorneys in Colorado Springs"
Timothy R. Bussey has once again been chosen by Colorado Spring Style magazine as one of their 2018 Top Attorneys. The voting process was open to the nearly 1,000 licensed attorneys in El Paso County, and only one nominee was allowed per practice area. Bussey was featured in both Criminal Law and DUI Law. Bussey’s set of skills has gotten him an AV Preeminent® rating, the highest possible rating from legal services giant Martindale-Hubbell. In addition, Mr. Bussey has been repeatedly listed in Colorado Super Lawyers and was again selected in 2018. Featured in "2017 Top Attorneys in Colorado Springs"
Tim Bussey has been selected by the National Trial Lawyers Association as a Top 100 Trial Attorney since 2007. He is the nationally published co-author of "Defending DUI Vehicular Homicide DUI Cases," Utilizing Forensic Science in Criminal Cases," Defense Strategies for Drug Crimes," and "Trends in DUI Discover." His knowledge and skill has earned Mr. Bussey an AV rating, the highest peer review rating under Martindale Hubbell's peer Review Rating process, a rating that show a lawyer has reached the height of professional excellence. Mr. Bussey has been repeatedly listed on Colorado Super Lawyers and was again selected in 2015. Mr. Bussey is also a requested speaker at state, national and international Continuing Legal Education seminars and meetings. He is a nationally published co-author of six books and spoke at the American Chemistry Society National Meeting in 2011. Featured in "2016 Super Lawyers Magazine"
Timothy Bussey of The Bussey Law Firm, P.C. has been fighting for his clients’ rights for nearly 25 years, amassing an extraordinary record of success representing Coloradoans accused of crimes and those wrongfully injured…A fierce advocate, Bussey mounts creative attacks designed to obtain the best possible outcome for his clients, whether through settlement or trial. His knowledge and experience is formidable: since 1991, Bussey has been an active duty air force judge advocate, a prosecutor, a criminal defense attorney and a plaintiff's attorney. 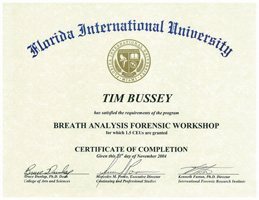 Timothy Bussey is the only attorney in Colorado with the ACS Forensic Lawyer-Scientist Designation, a unique and exclusive title reserved for lawyers that complete an in-depth, hands-on series of classes in forensic science. As a graduate of the program, Mr. Bussey has the knowledge and experience to bring valid scientific evidence into the courtroom on behalf of his clients. Featured in "2015 Top Attorneys in Colorado Springs"
Criminal Defense Attorney Timothy Bussey was selected as one of Colorado Springs' Top Attorneys for the second year in a row by Colorado Springs Style magazine. Mr. Bussey was chosen as one of the best attorneys in the city in the field of DUI Law by his colleagues in the El Paso County Bar Association. Renowned for his groundbreaking work in trial tactics and techniques, Mr. Bussey recently garnered acclaim for exposing inaccuracies in the blood alcohol test rests provided by the Colorado Department of Public Health and Environment Crime Laboratory. He made a similar discovery at the Colorado Springs Metro Forensic Laboratory that would become a key component in the U.S. Supreme Court's final decision in Bullcoming v. New Mexico, 131 S. Ct. 2705 in 2011. Attorney Timothy Bussey has earned ongoing recognition throughout more than two decades as an attorney, receiving an AV rating under the Martindale Hubbell's peer Review Rating process, as well as a Top 100 Trial Attorney selection by the National Trial Lawyers Association. He is a frequently requested speaker at Continuing Legal Education seminars at the state, national, and international level, and a nationally published co-author of six books. Attorney Timothy Bussey Selected as One of the Top Attorneys in Colorado Springs Colorado Springs Style has selected criminal defense attorney Timothy Bussey for their “2014 Top Attorneys in Colorado Springs” list. Through a confidential peer-to-peer review, the publication created a list of the city's best lawyers via recommendations by local attorneys. Attorney Timothy Bussey was selected for the field of DUI Law based on votes from attorneys in all fields of practice and his more than two decades of experience in criminal and DUI cases. Recommendations are combined with research to select only the best lawyers in the city. Mr. Bussey is known for being a source for many lawyers seeking to learn innovative trial tactics and techniques. Colorado Springs Style also cited his recent work exposing problems with the Colorado Department of Public Health and Environment Crime Laboratory's blood alcohol testing that led to unfair charges against countless Colorado residents. Timothy Bussey's continued success has also led to other recognitions, including being selected by the National Trial Lawyers Association's Top 100 Trial Attorneys list since 2007 and being repeatedly selected for inclusion by Colorado Super Lawyers. Timothy Bussey has achieved membership into The National Trial Lawyers Association. The organization named him a Top 100 Trial Attorney in Colorado. Membership is obtained through special invitation and is extended only to those attorneys who exemplify superior qualifications. Timothy Bussey has been selected for membership by Super Lawyers®. The selection process is multi-phased and includes independent research, peer nominations and peer evaluations. Mr. Bussey has been given a Silver award level to celebrate his many peer reviews, client reviews, and top overall rating on Martindale-Hubbell. Timothy Bussey has received an "AV" rating by Martindale-Hubbell, the highest rating a legal professional can attain for ethical standards and professional ability. Ratings include Legal Knowledge, Analytical Capabilities, Judgment, Communication Ability and Legal Experience. Timothy Bussey is rated "10 Superb" by Avvo, a professional organization that rates Lawyers based on Experience, Industry Recognition and Professional Conduct. Timothy Bussey has earned the Clients' Choice Award by Avvo for his commitment to offering sound advice, including his "10 Things to Do After an Arrest in Colorado" article posted on Avvo. Timothy Bussey has been selected by America’s Top 100 LLC, an organization that rewards the most accomplished professionals in many areas of practice: attorneys, doctors, dentists, accountants, and more. Membership in America’s Top 100 High Stakes Litigators™ is limited to the top 100 attorneys in each state – less than 0.5% of all practicing attorneys in the U.S. To qualify, each nominee must have litigated a high-stakes legal matter involving no less than $2 million for a client. That’s not all. Qualified candidates are then ranked based on experience, legal achievements, case results, reputation, and community impact, and only the finest attorneys are given the honor of being selected to the list. Timothy Bussey is a member of the Million Dollar Advocates Forum, one of the most prestigious groups of trial lawyers in the United States. Membership is limited to attorneys who have won million and multi-million dollar verdicts and settlements. Fewer than 1% of U.S. lawyers have been granted membership. Timothy Bussey has been selected by Expertise as one of the top 20 DUI lawyers out of a possible 106 in Colorado Springs. The organization’s selection process is based on each nominee’s reputation, professionalism, availability, credibility, and experience. In 2016, The Colorado Springs Gazette presented The Bussey Law Firm, P.C. a bronze award for their outstanding legal contributions to the people of Colorado Springs and all of El Paso County. Timothy Bussey is a Sustaining Member and former State Delegate of the National College for DUI Defense, a non-profit corporation dedicated to the improvement of the criminal defense bar. Members represent the most experienced DUI defense attorneys in the country. Timothy Bussey presented a detailed analysis of the Metro Crime Lab controversy to the American Chemical Society. During Mr. Bussey's presentation, he considered legal and scientific perspectives concerning the use of inaccurate blood samples to prosecute alleged driving under the influence (DUI) offenders in Colorado. Timothy Bussey is a life member of The National Association of Criminal Defense Lawyers, a preeminent organization and bar association whose mission is to ensure justice and due process for persons accused of a crime. Timothy Bussey has held positions in the Office of the District Attorney, Fourth Judicial District (El Paso and Teller Counties), as Deputy District Attorney. In addition, he is a former Teller County Office, Cripple Creek, Colorado, Sole Deputy District Attorney. Timothy Bussey has served as Captain, Active Duty Judge Advocate and Area Defense Counsel for the United States Air Force. Timothy Bussey is a requested speaker at local, state, national and international Continuing Legal Education seminars and meetings for innovative trial tactics. Some of his most recent speaking topics include "Challenging DUI Blood Tests", "Forensic Science & The Law", "Colorado state crime laboratory: What went wrong?" and "Forensic Chromatography III: Theory and Practice." 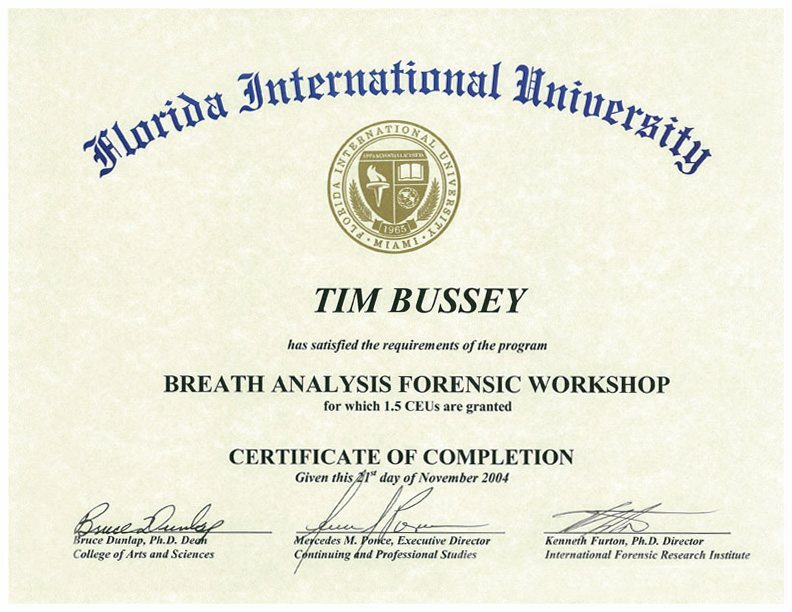 Timothy Bussey is a Forensic Expert Trainer at Trial Skills University. He teaches cutting edge techniques to other attorneys along with providing the legal community with up to date webinars. 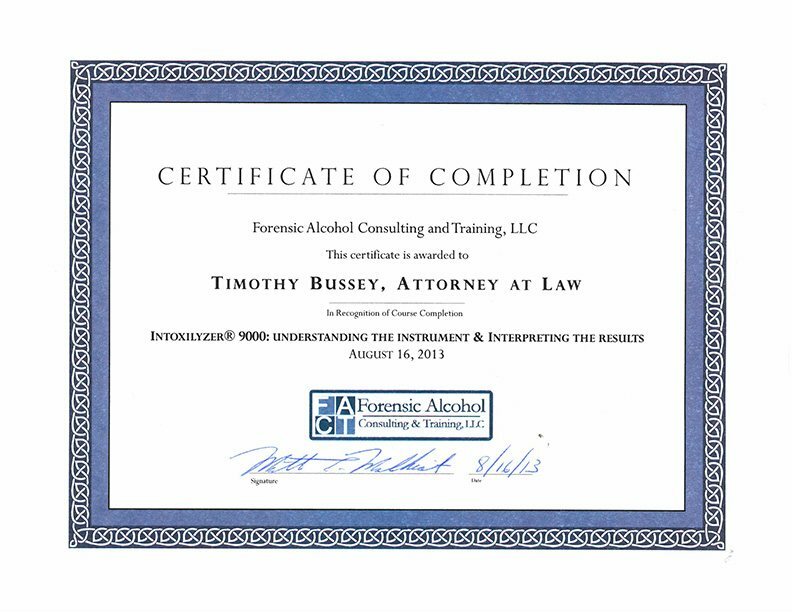 Timothy Bussey is an appointed Colorado State Ambassador by the DUI Defense Lawyers Association, an organization that provides top-notch DUI legal training to lawyers across the country. Timothy Bussey has achieved Lead Counsel Rated status by Lead Counsel for Professional Experience, Peer Recommendations and Spotless Record. Timothy Bussey is a graduate of Trial Lawyer’s College, a rigorous training program founded and taught by acclaimed defense attorney Gerry Spence, who has never lost a criminal case. TLC attorneys are dedicated to “obtaining justice for the poor, the injured, the forgotten, the voiceless…and to protecting the rights of such people from corporate and government oppression.” As a graduate of the program, Mr. Bussey gained knowledge and experience in using psychodrama—that is, using stories to connect with an audience. 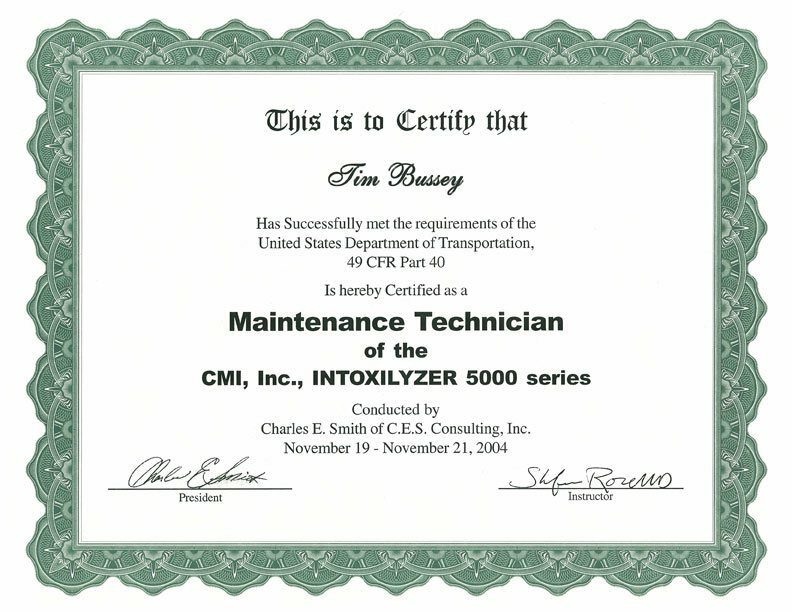 With this method in his arsenal, Mr. Bussey has continued to receive results for his clients. Timothy Bussey is a national published author who has provided readers with proven legal strategies for success. In his books, Mr. Bussey analyzes how to interweave witness testimony to build an effective defense and offers necessary guidance for helping clients understand the key issues that arise during a DUI case. Mr. Bussey is featured in "Defending DUI Vehicular Homicide Cases: Leading Lawyers on Understanding DUI Cases, Developing a Thorough Defense, and Negotiating Settlements (Inside the Minds)." The book provides an authoritative, insider's perspective on handling a vehicular homicide or manslaughter case where a client was driving under the influence. Mr. Bussey is featured in "The Legality of Search and Seizure in DUI Cases, 2013 ed. : Leading Lawyers on Leveraging Science and Process to Develop Winning Defense Strategies (Inside the Minds)." The book provides an authoritative, insider's perspective on best practices for identifying and litigating Fourth Amendment violations in DUI cases. Mr. Bussey is featured in "Witness Preparation and Examination for DUI Proceedings, 2013 ed. : Leading Lawyers on Understanding the Role of Witnesses in DUI Cases (Inside the Minds)." The book provides an authoritative, insider's perspective on communicating with scientific experts, law enforcement officers, and civilian witnesses when your client is accused of driving under the influence. Mr. Bussey is featured in "Trends in DUI Discovery, 2014 ed. : Leading Lawyers on Developing Effective and Innovative Discovery Practices for DUI Cases (Inside the Minds)." The book provides an authoritative, insider's perspective on communicating with scientific experts, law enforcement officers, and civilian witnesses when your client is accused of driving under the influence. Mr. Bussey is featured in "Defense Strategies for Drug Crimes, 2014 ed. : Leading Lawyers on Interpreting Today's Drug Cases, Developing a Thorough Defense, and Protecting a Client's Rights (Inside the Minds)." The book provides an authoritative, insider's perspective on the latest issues, developments, and cases involving discovery in driving under the influence cases. This book guides the reader through the discovery process and the types of evidence you encounter during these cases, including officer testimony and reports from field sobriety tests, and law enforcement dash-cam audio and video recordings. Below, you may view all of Mr. Bussey's certificates and awards that he has achieved since becoming a Colorado criminal defense attorney. 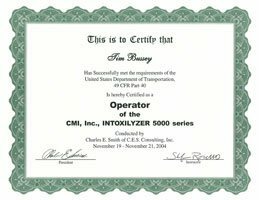 Mr. Bussey's certifications include one to operate the Intoxilyzer 5000, as well as one to maintain the breath testing device. This device is comparable to the Intoxilyzer 500EN, which is used to prosecute breath cases in many states, including Colorado. 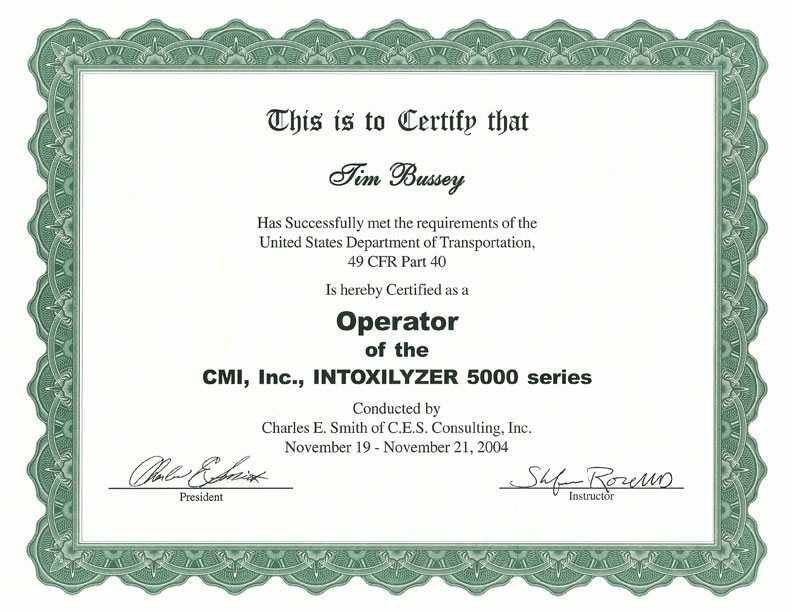 Mr. Bussey also owns an Intoxilyzer 5000 device, which he keeps in his office. 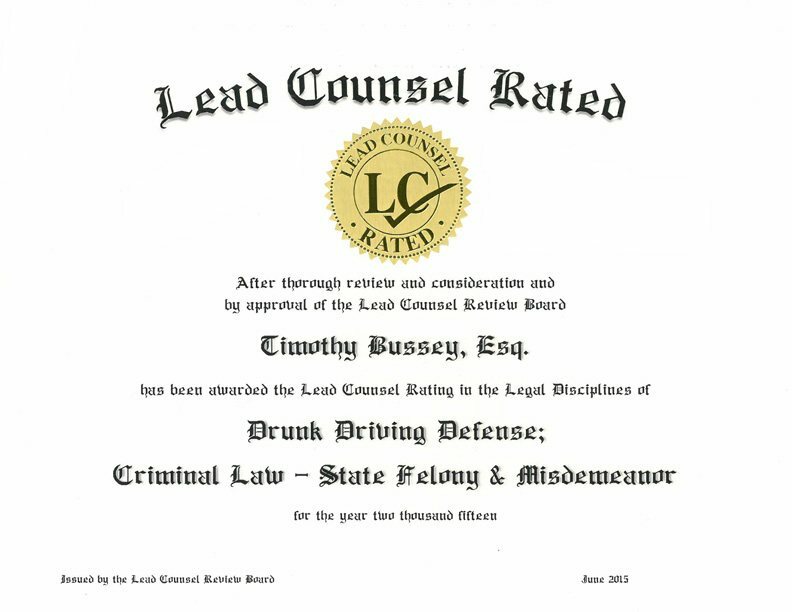 In addition, Mr. Bussey has achieved Lead Counsel Rating in Drunk Driving Defense and Criminal Law - State Felony & Misdemeanor from the Lead Counsel Review Board. 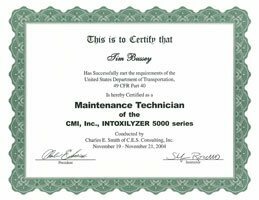 © 2019 Timothy R. Bussey - Drunk Driving Defense Attorneys - Driving While Intoxicated Defense Lawyers - Criminal Defense Lawyer - All rights reserved. Colorado Springs Criminal Defense Attorneys Disclaimer: The drunk driving and criminal defense legal information presented at this site should not be construed to be formal legal advice, nor the formation of a lawyer or attorney client relationship. Any results set forth herein are based upon the facts of that particular case and do not represent a promise or guarantee. 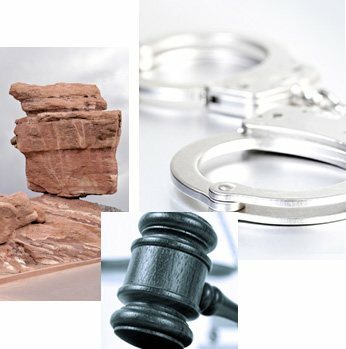 Please contact a Colorado Springs criminal defense lawyer for a consultation on your particular legal matter. This web site is not intended to solicit clients for matters outside of the state of Colorado.